What are the Tasks Involved in Writing a Well-Crafted Business Blog? The other day the topic of blogging came up with a friend when they saw my blogging fuel gauge mug from HubSpot. Essentially, the conversation went a little like this: "Blogging seems like it would be so easy, I should do freelance blogging." "Well, it's a lot more work than it seems like it would be, have you ever written a blog post from start to finish?" "Wouldn't it just be writing a post, proofing it and publishing it?" Now understandably, if you've never written a business-based blog post before, it would seem pretty ideal from the outside looking in. Realistically though, there is so much more work involved in business blogging than meets the eye. Between planning the strategy behind the blog, optimizing posts for search, sourcing the right imagery, flowing and formatting posts to look the way you want, and then continuing to interact with posts in the future, you're looking at a far greater time spend than you may have originally guessed. Not realizing this beforehand, many companies jump straight onto the content marketing bandwagon without fully understanding the necessary involvement, and unfortunately these companies usually end up with costly blogs at a standstill. Before you start up a business blog, take the time to determine an action plan. Do you have the resources available to follow through on all tasks from start to end? Should you consider hiring an external resource? To answer these questions, consider the full breakdown of blogging tasks below! 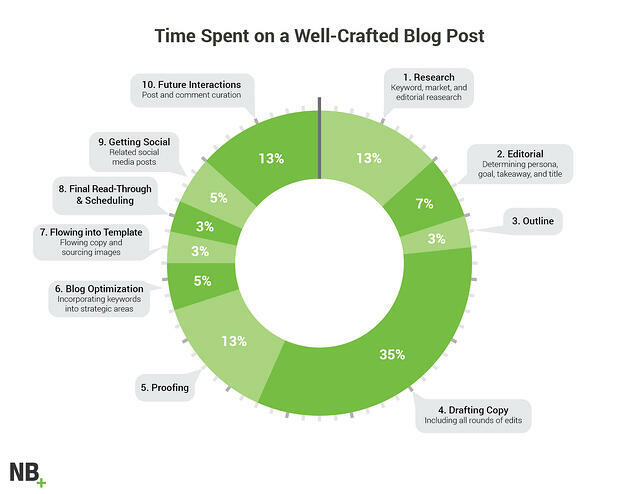 What ARE the Tasks Involved in Creating a Well-Crafted Business Blog? Putting in the appropriate research before writing a blog post is very important. It's the first step that will truly mold the intention of the post and give it meaning. Assuming you've already determined your who your buyer persona is, during the research phase you will want to define your thesis statement or the purpose for the blog (typically this would be framed to solve any of your persona's pain points), the key term they would use to find your post, procure any facts or statistics needed to enhance your point and determine your goals & tools for measurement. Next it's helpful to begin thinking of the title at this point. Notice how I said 'begin'? That's right, your title is perhaps the most important part of your post. It needs to accurately reflect the purpose of your post while also enticing a click. It's very rare that I end up going with the original title of my posts. Keep brainstorming ideas throughout the process of writing your post. I find that creating an outline helps me stay on track while writing a blog post, which also helps me get my point across and not miss any important components in the midst of writing. Whether you take the time to write out your outline or just think about the framework for your post, this is actually a great way of saving some time. The pre-focused structure takes away the time thinking, "what next?" Next up is actually getting the words down on paper (or, you know, screen). At times this may be a breeze - other times you may actually smell smoke streaming from your ears. 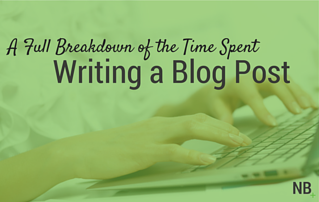 Understandably, actually writing the post does take up the largest percentage of time. This also includes taking time to work on second or third revisions as well. Don't be afraid to go back to the drawing board to achieve the best post possible (even after publishing, which I'll address in a little bit). At this stage, it's likely that the post has moved on to another person which requires some time for adjustment and communication. Having another person take the time to proof your work allows for a separate perspective and a second set of eyes scanning for unaccounted errors or wording that may be misconstrued. This is the area where you can reassess whether or not you're clearly answering your persona's pain points, and then make sure the post is optimized to the intended keyword. It's the time when you test out the flow, and make sure everything fits together like a puzzle. If there are any missing pieces, the picture will not be complete for the reader. The words of a post alone do not construct the puzzle that I discussed above. Oftentimes, the look of the post alone can set the tone. Depending on the platform you're using to publish blog posts, correctly formatting the words and images within your post to construe meaning can take some time to complete. In order to get the word out about your post, it's likely that you'll want to construct corresponding social media posts. Automated posts are great, but do not have nearly the same impact as individually drafted posts. You'll also want to consider the time it will take to respond to comments on the post after it's published, or make future revisions as information changes. The last thing you want to do is leave your post to be swept away in the wave of new, more exciting content. With every blog post comes the responsibility of maintaining future interactions. In following a rigid process that considers all of the steps involved in creating a strategic blog, New Breed has realized not only a 557% increase in traffic over the past two years, but also a 40% increase in our lead conversion rate. With a wealth of information displayed right there on our PubHub, leads are more trusting of our services and the quality of our work. In our experience of running our own blog as well as the blogs of our Inbound customers, we've seen dramatic inclines in online reach and business sales across the board. There is no doubt that when done correctly, blogging can be extremely beneficial to a business' bottom line.